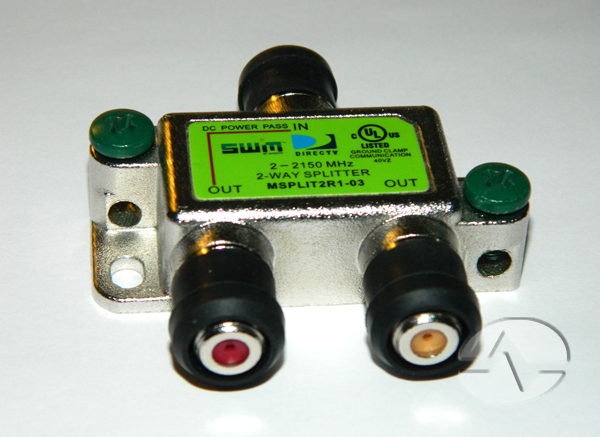 This is a splitter designed for DIRECTV SWM systems. Two of the three connections on it have a red center, while the center of the other one is sort of off-white. Did you ever wonder why? Whether it’s a satellite dish or an antenna, many devices require power to function. They amplify or otherwise “massage” the signal before it gets to a television or receiver. RF signals, especially those from satellites, can be very weak and special electronics may be required to help you receive them. The easiest way to get power where it needs to go is through the cable itself. DC power doesn’t have any effect on the RF signals traveling through a cable since DC power travels through the center of the cable while RF only travels on the outer skin of the center conductor. So, many systems use something called a “power inserter” or “power injector” to put enough power in the cable to do what needs to be done. Under normal circumstances, voltage running through a cable is considered to be a bad thing, the result of a power surge. So, a well-made splitter will block this higher voltage when it passes through. (This is called a “DC Block.”) If you are running power to an antenna or dish, you need a special splitter that allows that power to pass through. (That’s called “DC Power Passing.”) It’s easy to think that the power passes from the one input to the many outputs, but it actually passes the opposite way, toward the antenna or dish. The red ports are the DC Power Passing ports. The yellowish port has a DC block. What happens if you accidentally run power to a device that’s not expecting it? Let’s say, it’s not pretty. Generally the device will fry itself fairly quickly, sometimes with a pleasant, although slightly scary, light show. You can run a non-powered line through a power-passing splitter just fine, but connect a receiver to the wrong end of a power-passing line and you will have trouble, my friend.